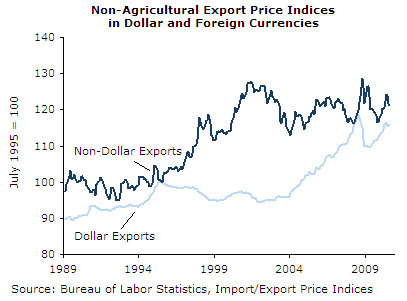 Falling dollar makes exports less expensive, even as export price index rises. The Consumer Price Index rose 0.3 percent in August, for the second consecutive month. The rise is almost entirely attributable to the recent increase in energy prices, which jumped another 2.3 percent in the month. Outside of food and energy, the core price index of consumer goods remained unchanged. Over the last 12 months, core prices have risen only 0.9 percent. The price of housing was unchanged in August and has grown at a 0.2 percent annualized rate since May. The very slow growth in housing prices came despite a 0.5 percent increase in the price of household energy. Lodging away from home showed a fall of 1.3 percent, reversing much of the increases of the previous two months. Over the last three months, the price of lodging has grown at a 1.0 percent annualized rate, compared to 18.2 percent over the previous three months. Rent of primary residences fell 0.1 percent last month and 0.3 percent annualized over the last six. Owner’s-equivalent rent was unchanged in August and has grown at a 0.1 percent annualized rate since February. Post-housing-bubble real rent prices are still falling and have run roughly 1 percentage point below core inflation over the last six months. Though weighted as a much smaller share of the consumer price index, apparel prices also fell slightly in August, partially reversing recent gains. Over the last three months, the price index for apparel rose at a 5.0 percent rate, but rose only 0.7 percent over the last six. Transportation contributed greatly to measured inflation with a 1.2 percent jump in August. Most, but not all, of this price increase is attributable to fuel prices as the price of gasoline rose 3.9 percent in the month. Despite a 4.1 percent fall in gas prices in June, the last three months have seen prices rise at a 16.2 percent annualized rate since May. The price of new vehicles ticked up 0.3 percent and the price of used cars rose 0.7 percent. Used vehicle price inflation is still high in the wake of the cash-for-clunkers used car shortage. With the recent rebound in the rate of inflation, used car prices rose 9.9 percent in the last three months. Despite this, inflation remains well below the 30-plus percent rate of inflation in the second half of 2009. Elsewhere, the price of hospital services rose 0.5 percent in August, more than reversing the surprise fall in July. The price of medical care generally rose by a comparatively modest 0.2 percent. Over the last three months, medical care inflation has run only 1.8 percent annualized—compared to 2.6 percent for the three months ending in May and 4.8 percent for the three months before that. The price of education held steady as tuition prices grew at a modest 0.1 percent. After falling the previous two months, the price index for non-fuel imports rose 0.3 percent in August. The price of fuels also rose rapidly—1.7 percent in the month—but the rise in import prices was broadly-based. All major categories of imports showed accelerating inflation. Non-agricultural export prices show much of the same broad acceleration, rising 0.5 percent in August after declines of 0.8 and 0.2 percent in June and July. The broad-based return to inflation in both imports and exports is consistent with a falling dollar. As the real price of dollars declines relative to other currencies, imports become more expensive as purchasing power declines. On the flip side, exporters may demand additional dollars for their goods even as the prices of exported goods fall in other countries. These seemingly contradictory effects have progressed since the real dollar began declining in early 2002—following a large run-up which began in the mid-1990s. From 1995-2002, the dollar rose 34 percent relative to other world currencies. This made U.S. imports of foreign goods very inexpensive and exports of goods to other countries relatively costly. Although the export price index fell 5.7 percent over this time, that index is measured in dollars. Rapid appreciation of the dollar meant that consumers in foreign countries paid 27 percent more (in their own currencies) for the goods in early 2002 than they did in mid-1995. Since early 2002, the trend has reversed. The (dollar) price index for U.S. exports has risen 23 percent, but the real dollar has fallen 22 percent—resulting in a small decline in the price of these exports as seen by our trading partners. Each change in the value of the dollar has had a significant impact on the balance of trade. From mid-1995 to 2002, the U.S. trade deficit rose from 1.0 percent of GDP to 5.5 percent, but has since fallen to 3.7 percent. Despite increasing import prices, core inflation is still very much in check. The real wage was nevertheless unchanged in August, high unemployment making an inflationary wage-price spiral unlikely.